The Blue-winged Macaws (Primolius maracana) - in captivity better known as the Illiger's Mini Macaws - are members of the mini-macaw family. They occur naturally in central and eastern South America. Illigers are closely related to the Yellow-collared Mini Macaws (Primolius auricollis) and Blue-headed Mini Macaw (Primolius couloni), and some consider them conspecific (one and the same species) with the latter. 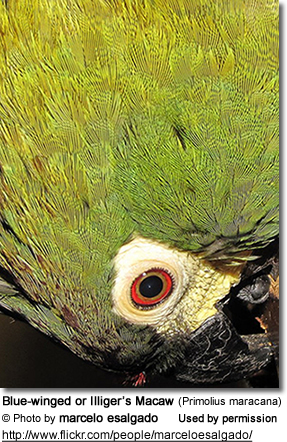 These parrots are endangered in the wild as their habitat is destroyed by deforestation. To preserve this species for future generations, every effort should be made to place any wild-caught Illigers into well-managed breeding programs to allow them to contribute to the gene pool of captive populations. Central and southern Brazil, with a remnant population in north-east: They occur(ed) in the states of Pernambuco, Piauí, Maranhão, Pará (including Serra do Cachimbo and Marajó island), Tocantins, Goiás, Mato Grosso, Mato Grosso do Sul, Minas Gerais, Bahia, Espírito Santo, São Paulo (in and around Caetetus Ecological Station), Paraná, Santa Catarina, Rio de Janeiro (atlantic forest) and Rio Grande do Sul. Now believed extinct in the latter. Northeastern Argentina: provinces of Misiones and northern parts of adjacent Corrientes in far north-eastern Argentina) . There are no recent records of them in Misiones or other parts of Argentina. This species is to be believed to be virtually extinct in this country. They are mostly found in forests (mangrove, deciduous, humid / evergreen) - with a preference for gallery forests (along water ways); as well as palm groves and cerrado regions (tropical savanna) up to 3,300 feet (~ 1,006 meters). They typically remain at the forest edge and close to bodies of water. 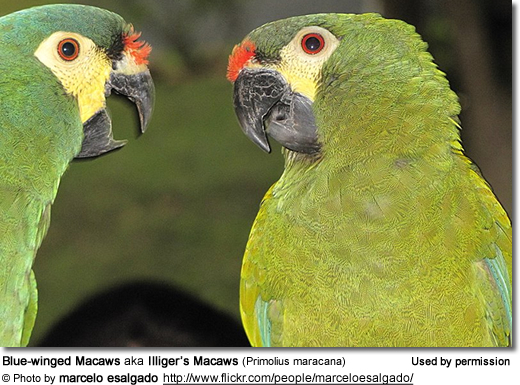 Illiger's Macaws are now difficult to find across much of their former vast range. Their numbers have declined to such an extent that this species is now classified as Vulnerable by Birdlife International. Less than 10,000 of these birds are still believed to exist in the wild due to a combination of deforestation (destruction of their favored habitat) and capturing for the pet trade. In Argentina, these birds were hunted by farmers who considered them pests as they foraged on their agricultural crops. They are now believed to be extinct in Misiones, Argentina and Rio Grande Del Sul in Brazil. These small macaws measure 14 to 17 inches (35.6 to 43.2 cm) in length - including the long tail; and weigh around 9.2 oz (265 grams). 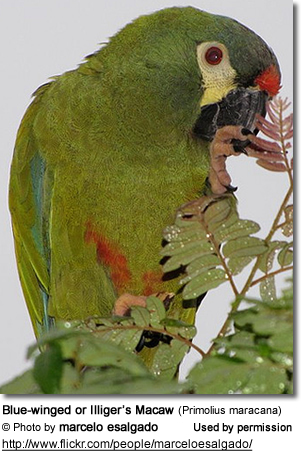 Their plumage is mostly green; except the forehead and sides of abdomen and lower back are orange-red to red. The crown is blue; the head, nape, and cheeks are greenish-blue. The flight feathers are blue with bluish-green edges. The undersides of the wings are pale yellow. The top of the tail is olive then turning reddish brown and then bluish towards the tip. 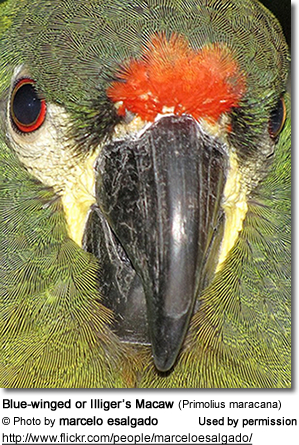 Their typical Macaw naked facial patch is generally pale yellowish toned, but in captive birds the color may fade to whitish. Fine dark feather lines can be seen across these bare facial patches. The irises are orange-brown. The moderately-sized bill is black and the legs are flesh-colored. Females have a duller plumage compared to the males. Juveniles have a paler plumage and less red coloration on the forehead. The red patches on the abdomen and back are tinged with yellow. There are horn-colored edges to their bills. The tail is shorter and the eyes brown. 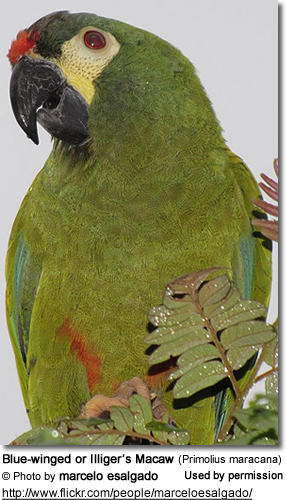 The Illiger resembles the Red-bellied Macaw (Orthopsittaca manilata), but the Illiger's can most easily be identified by their orangey eyes (dark in the Red-bellied), orangey-red forehead and red rump. In the wild, they feed on a variety of food items, including seeds (mainly of the Cnidoscolus phyllacanthus, Jatropha, Guazuma ulmifolia and Melia azedarach plants), nuts, fruits, berries, flowers, green plant matter and some insects. They will also forage in grain and maize fields leading to their persecution by farmers. Like all parrots, they pick up food in their claws and eat it from there. Captive birds are quite finicky and have a reputation of will not eat food they are bored with. They emit loud screeching and other raucous calls that are mostly heard in the early mornings or late afternoons / evenings, or when flying to and from their feeding places.